Located in Quang Nam province, the ancient town of Hoi An is recognized as a World Heritage Site by Unesco and has an exceptionally well-preserved example of a Southeast Asian trading port dating from the 15th to 19th century. For my wife Karen and I, Hoi An’s most notable asset may be the water drawn from it’s centuries-old wells. It’s crucial to making the noodles for Cao Lau, a pork filled tour de force featuring slices of stewed pork shoulder, a rich dark brown broth, and crunchy squares of dough cooked in pork fat. 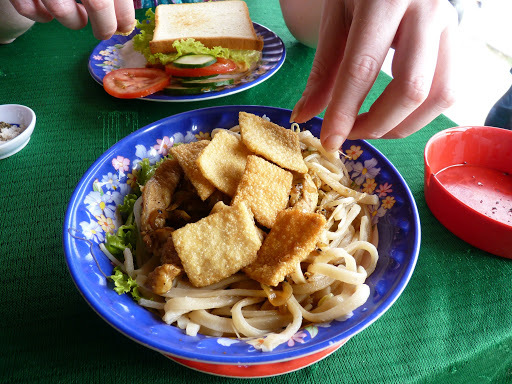 The noodles possess a chewiness not present in other Vietnamese rice noodles, a characteristic attributed to a special solution that the rice is soaked in before the grains are ground to make these particular noodles: lye mixed with water from those old wells. Normal bun, or rice noodles, are made from rice soaked in plain water. According to locals, Cao Lao is linked to Japanese merchants who, along with those from China, controlled most of the port’s export trade in the 17th century. By the early 1600’s, a part of Hoi An became a Japanese district–the Chua Cau or Japanese Bridge, as it’s more widely known, a 12-meter-long, pagoda-like structure that spans a stream, is a relic of those days. The story goes that an enterprising local cook, who was eager to capitalize on the Japanese longing for familiar foods, created an exceptionally chewy rice noodle that, with its rustic, unrefined texture and grayish-brown color, is the spitting image of Japanese buckwheat soba. i like this food so much ^^. It's so delicious.Here the recipes Cao Lau recipes if you want to cook Cao Lau yourself at home.